Books 24×7 – More than just books! Books 24×7 is an online collection of books and videos tailored for use in the subjects of business, information technology, and engineering, as well as books that address healthy living and well-being, which are useful regardless of your field of study. Whether you’re looking for business management techniques, a coding guide for software design, or information about how civil engineers design with earthquakes in mind, Books 24×7 has a book with the information you need. 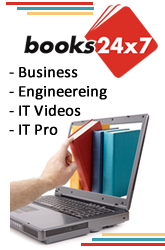 In addition to hosting ebooks, Books 24×7 provides convenient tools to help you manage the information you’ve found. With the option to place digital bookmarks, generate notes that are tied to a location in the book, and create folders to help you group texts you’ve used into various categories, Books 24×7 lets you manage your information and easily access it from anywhere. On the business portion of the database, SkillSoft, the company behind Books 24×7, also hosts both live and archived webinars on various business-related topics, all of which can be accessed through the Books 24×7 main page. Previous PostLibrary Creative Commons and moreNext PostTime to give Mango Languages a try!